Originally posted: April 24, 2018 . Last modified: December 5, 2018 . 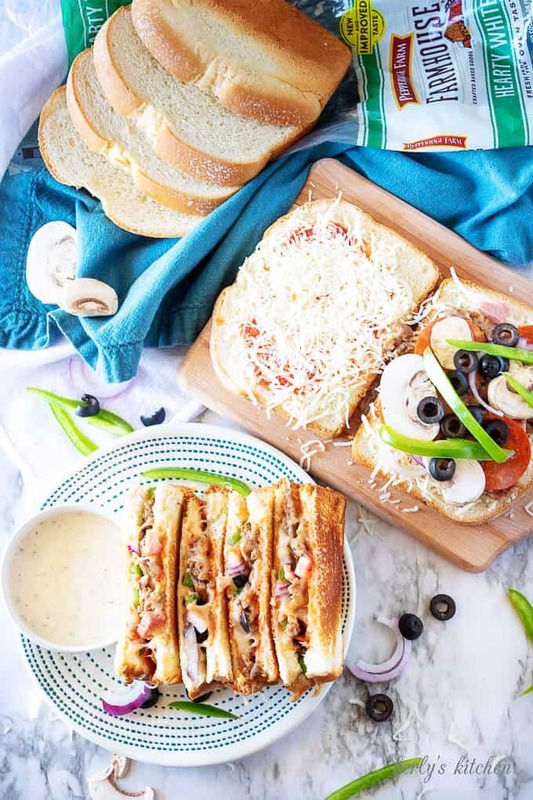 Build a hearty supreme pizza grilled cheese with Pepperidge Farm Farmhouse® Hearty White Bread. It’s thick-sliced and has fresh from the oven taste making it the perfect bread to compliment all those rich flavors. If you are like us, then a regular old grilled cheese sandwich just doesn’t cut it anymore. That’s why when we were approached about the new Pepperidge Farm Farmhouse® Hearty White Bread, Kim and I couldn’t wait to put it to the test. What better way to test Pepperidge Farm Farmhouse® Hearty White Bread then with a hearty pizza grilled cheese. 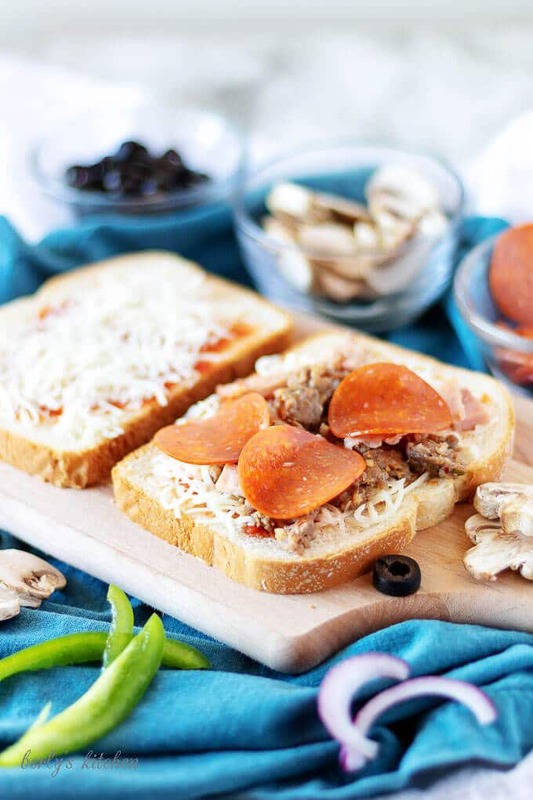 So we loaded this thick sliced bread with ham, sausage, pepperoni, cheese, and vegetables. 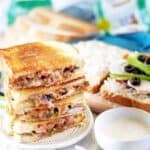 I’m thrilled to say this bread holds up to all those fillings to create a delicious and flavorful sandwich. While we sat down to eat our sandwiches, I decided to take a look at the link Pepperidge Farm® provided so I could learn more about this Farmhouse Hearty White Bread. All the nutritional facts and ingredients are listed along with a product locator. The product locator is important because this Farmhouse Hearty White Bread is only available in select locations. So, be sure to click this link and then click the “Where to Buy” button in the top right corner to find out where you can pick up a loaf of this thick-sliced bread. Now that you know what kind of bread you should be looking for, how about we get started making this hearty pizza grilled cheese? First, prep all of your ingredients prior to getting started because it will make building and cooking the sandwiches much easier. We use little ramekins, but any bowls will do, just keep them at arm’s length when it comes time to build. 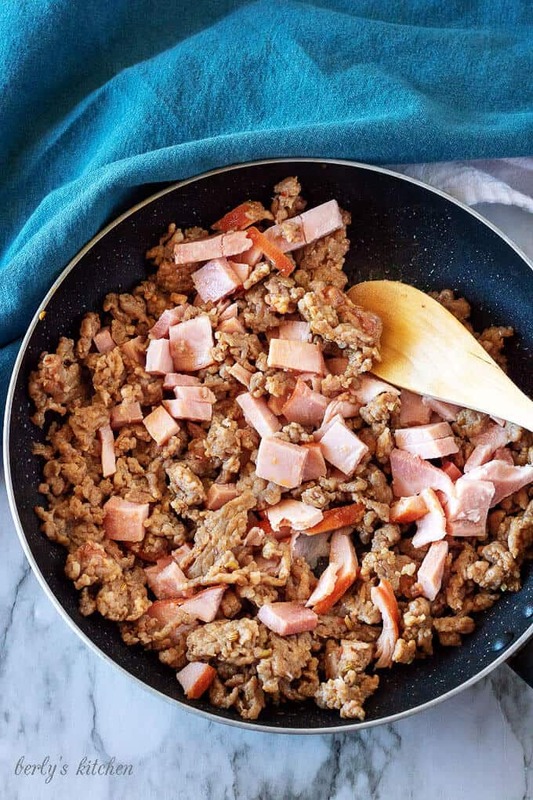 Next, in a large skillet over medium-high heat, cook the sausage for 5-7 minutes, then add the diced ham and let the mixture cook for an additional 2-4 minutes or until the sausage is done. Set the meat mixture aside. After that, it’s time to start building the sandwich. Begin brushing one-side of 2 slices of bread with marinara and sprinkle those sides with half an ounce of mozzarella cheese each. 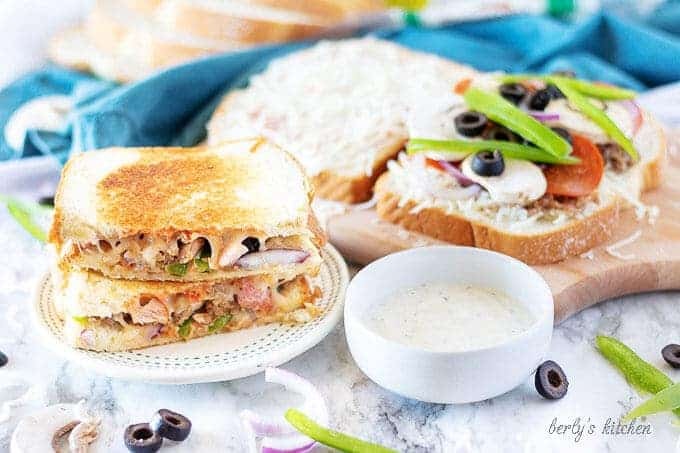 Now, sprinkle a couple of tablespoons of the meat mixture on one-half of the sandwich and start layering your other ingredients, like pepperoni, red onions, olives, mushrooms, and peppers. Once you’ve built the sandwich, take the half, that only has mozzarella and marinara, and place it on the other half completing your grilled cheese. Then, take your melted butter and brush the top of the grilled cheese. Afterward, lay the sandwich, butter-half down in the pan, and brush the other side with butter. Let the grilled cheese cook over medium heat for 3-5 minutes or until the bread is toasted. Flip the sandwich and let it cook for an additional 2-3 minutes or until that side is done as well. Remove it from the pan and cut it half for serving. Last, repeat steps 3-6 again until all four sandwiches have been completed. The pizza grilled cheese can be served with ranch or your favorite dipping sauce. If your mozzarella cheese isn’t properly melted, but the bread is toasted, pop the sandwich into your microwave on high heat for 20 seconds before serving. For a vegetarian version, try removing the meat and adding banana peppers, green olives, and spinach. Try combining melted butter, garlic powder, and a dash of sea salt to create a flavorful dipping sauce. 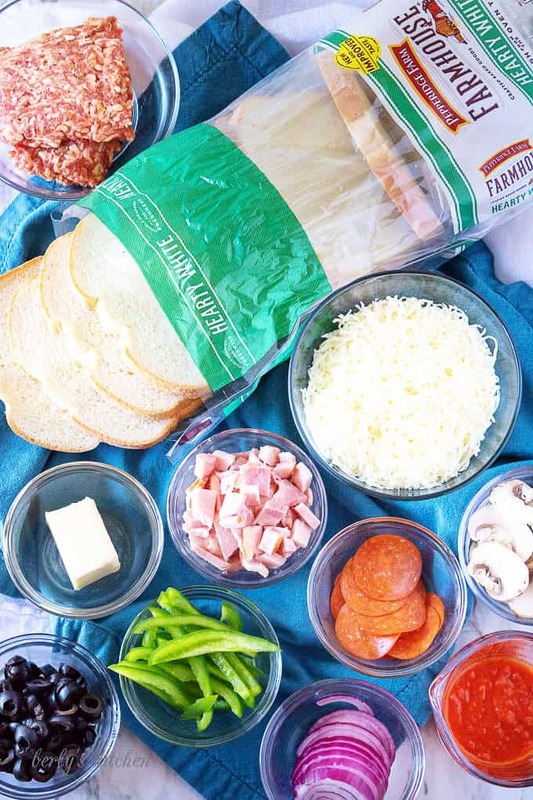 Build a hearty supreme pizza grilled cheese with Pepperidge Farm Farmhouse® Hearty White bread. It's thick-sliced and has fresh from the oven taste making it the perfect bread to compliment all those rich flavors. First, prep all of your ingredients prior to getting started because it will make building and cooking the sandwiches much easier. After that, it's time to start building the sandwich. Begin brushing one-side of 2 slices of bread with marinara and sprinkle those sides with half an ounce of mozzarella cheese each. Once you've built the sandwich, take the half, that only has mozzarella and marinara, and place it on the other half completing your grilled cheese. Then, take your melted butter and brush the top of the grilled cheese. Afterward, lay the sandwich, butter-half down in the pan, and brush the other side with butter. Let the grilled cheese cook over medium heat for 3-5 minutes or until the bread is toasted. Flip the sandwich and let it cook for an additional 2-3 minutes or until that side is done as well. Remove it from the pan and cut it half for serving. This is my kind of sandwich with all the tasty toppings! I really love the Italian sausage! Thanks, Analida! Italian sausage was a must! Lol! Omg the ultimate grilled, this looks amazing! Yum! My husband would LOVE this sandwich! Supreme pizzas were always my mom’s favorite when I was growing up. I bet she’d love this twist on that – seems like it’d be easier to make at home than a full pizza, too. YUM! What an awesome way to mix up pizza night! I like that you can make this without needing to prepare dough ahead of time. Thank you, Jenni! It’s a lot quicker than regular pizza. In fact, I pretty sure this was quicker than pizza delivery as well lol! Grilled Cheese is always a good idea! Love your filling options, here! Very creative. This recipe is amazing. It’s definitely a grown up approach to grilled cheese, but I also think this would be a great idea for a kids party because the kids could choose what toppings they want on their sandwiches. I’ve never tried this pepperidge farm bread, but I’m going to look for some of this farmhouse white, so I can make these sandwiches for my family. Great idea. 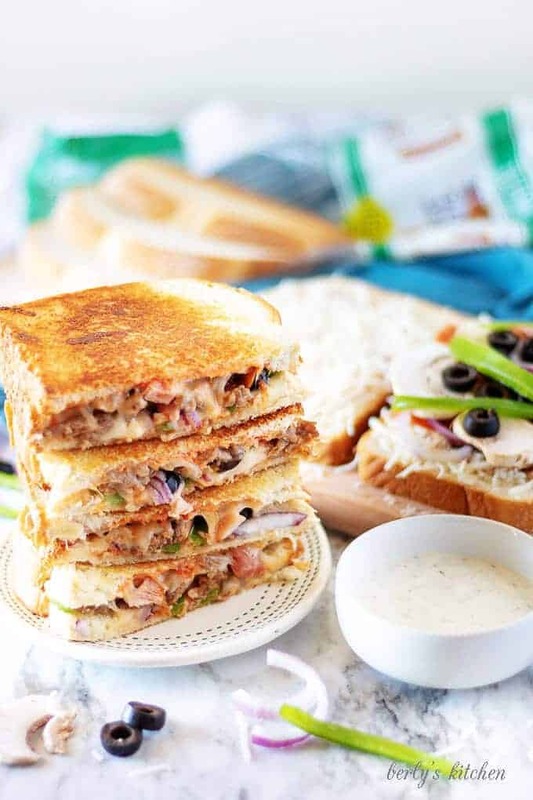 Oh goodness, this pizza grilled cheese is a fabulous idea!!! My husband will go nuts for this! Thanks, Anne! Yes, pizza without the fuss is exactly right! This is genius! My kids would love this. Pinning!! This is most definitely kid friendly, and the kids can even get involved with the assembly process. Plus, it’s a great way to get some veggies! Ooo I love the idea of a pizza grilled cheese. This sounds absolutely delicious! Dip it in a bowl of homemade tomato soup and it’s perfect. 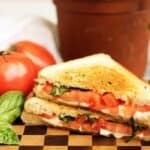 Tomato soup would be perfect with this sandwich!! I didn’t even think of that. Now, I want another one! I have honestly never thought of putting anything other than cheese in a grilled cheese sandwich, but now I feel like a whole new wonderful world of grilled cheese potential has been opened for me! I can’t WAIT to try this. 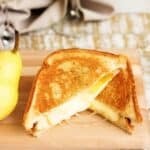 We love playing around with grilled cheese! Lol! Who knew pizza ingredients and on grilled cheese would pair so well together?